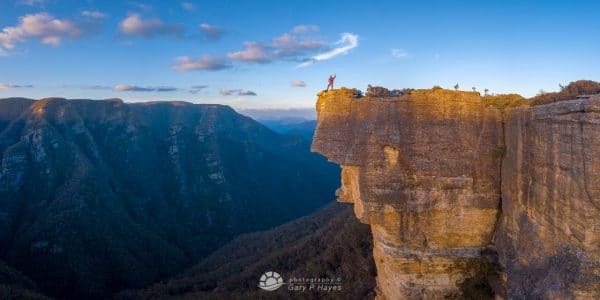 ABOUT: Kanangra Boyd National Park is a surprising area of wilderness not far from the main valleys of the Blue Mountains but only accessible by a long loop drive via Jenolan Caves, or a few days walk across the valleys. It contains the deepest gorges, most unique geology and is much less frequented by photographers, for examples my images from 1st trip already top of Flickr in terms of interest. There are a few designated trails around the Kanangra Walls which can be explored in a couple of hours or you can spend a full day on the plateau or deep in the gorges with endless photo ops. The rest of Kanangra Boyd park within easy access around the 30km dirt track (Kanangra Rd) contains a lot of wildlife, forested sunlight and in wet periods some river photo opps, but most photo interest is around the gorges at the lookout. PHOTO EQUIPMENT TO BRING: Bring a full range of kit and moderate wides through to medium telephoto with tripods and graduate neutral density filters for the golden hours, very important. Because of the likelihood of extended walking suggest a medium sized camera bag and lightweight but solid tripod. The main lookout has a limited angle of view and appears on many photos, consider trying a different viewpoint, perhaps fisheye or a more vertical stitch, after you have your generic shots! GETTING TO THE SPOT/S: To get onto Kanangra Rd dirt track, drive towards and past Jenolan Caves or pick up the Edith Rd from Oberon and follow the signs. The google map ref is the actual lookout, and the last 30km dirt track drive is doable by most good suspension cars, beware of a few potholes though.